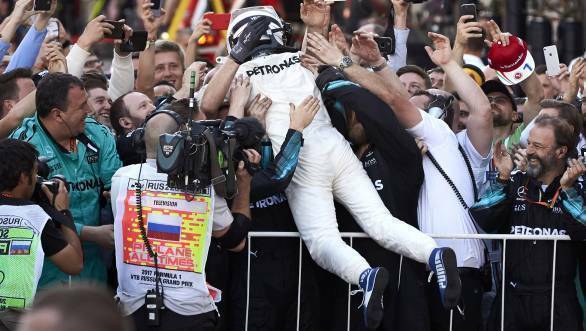 At long last, Valtteri Bottas scored his maiden Formula 1 victory. 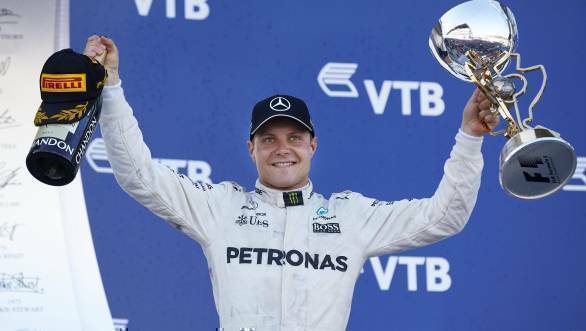 The Finnish driver took victory at the Russian GP at Sochi, winning in only his fourth race for the Mercedes AMG F1 team. His win might have been a long time coming, but when it finally did arrive, it was a commanding one. One that proved that Bottas certainly has what it takes. The man on pole at the Russian GP, however, was Sebastian Vettel. The German driver had clocked the fastest time during Q3 on Saturday, and with his team-mate Kimi Raikkonen claiming second spot on the grid, it was Ferrari's first front row lock out since the French GP in 2008. Bottas was third on the grid, having beaten team-mate Lewis Hamilton to the spot. 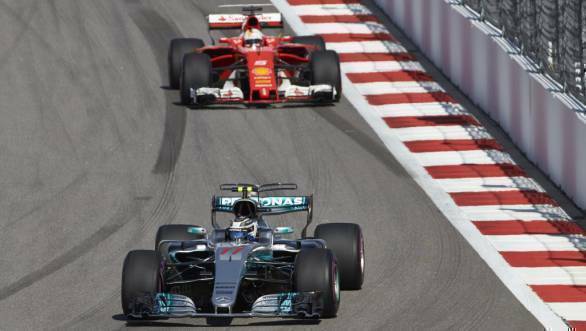 When the five red lights went out at Sochi, it was Bottas who managed to leap into the lead and eventually pull clear of Vettel. While Vettel had to settle for second place behind Bottas, it was Kimi Raikkonen who came under pressure from Lewis Hamilton during the early stages. But the Ferrari driver was able to keep the Mercedes driver at bay. Then came the Safety Car period, caused by a clash between Romain Grosjean and Jolyon Palmer. The two drivers were out of the race, as was Fernando Alonso, whose terrible season with McLaren continued. Alonso didn't make it to the race start, with his car's engine packing up on his way to the grid. Also retiring early from the race was Red Bull Racing's Daniel Ricciardo, who had to deal with a brake failure. When the race reached the halfway mark, Bottas came upon traffic in the form of backmarkers, but also had to deal with tyres that were nearing the end of their life. This meant that Vettel was able to catch up to the Mercedes driver, chipping away at his lead. Eventually it was Bottas who pitted first, and shod his Mercedes with new super-soft tyres. While Vettel stayed out for a long time, Raikkonen pitted first and came back out on track to start posting some excellent times. While Vettel eventually pitted at the end of Lap 34, Bottas was still out in front. But the fresh set of tyres helped the Ferrari driver, and four-time F1 champion, catch up to the car ahead of him. Vettel chased Bottas, brought the gap down to just two seconds, and eventually was able to get as close as one-second to the Finn. The fact that he could now use DRS meant that Vettel had every chance to attack Bottas. But the Finn didn't break a sweat. Eventually he pulled away, got past the Felipe Massa, who he lapped, and headed straight for the chequered flag. It was a not-so-happy Vettel who took second, ranting over the radio about Massa holding him up. Third place on the podium went to Kimi Raikkonen. Lewis Hamilton took fourth place. Fifth place went to Max Verstappen, followed by Sergio Perez in sixth and Esteban Ocon in seventh. Renault's Nico Hulkenberg took eighth place, while Felipe Massa to ninth and Carlos Sainz Jr claimed tenth place and a sole point for the Toro Rosso team.